Drywall - Replace or no? ForumsArrowRehabbing and House FlippingArrowDrywall - Replace or no? We're doing a rehab on a house in Sunriver, Oregon. It was built in the 70's. How do you determine if drywall/sheetrock should be replaced or is it possible to lightly sand and do new texture? If there is damage (extensive moisture, cracks, holes, etc) is may not be a bad idea to replace. Otherwise a nice coat of paint covers a lot of imperfections. I only replace drywall that needs to come out. I remove it from Kitchens and baths usually, as it is easier in those rooms due to the other work needed, but in nearly every other space I keep as much as possible. Even plaster I will keep, unless it needs to come out for smoother transitions with new drywall. Keep it unless it shows signs of water damage/mold/excessive damage. Consider replacing all the baseboards. If it is in good shape there is no need to replace it. If it has some normal damage ( nail or screw holes from hanging pictures) it can easily be repaired. Large holes will require a suitable piece of drywall to be put in. The only time you would strip it all out is in case of water damage or if you wanted to insulate behind it. Keep it. Knockdown and spray finishes take care of 99% of your problems unless there is mold or water damage. Solid advice here. I was just asking myself the same question so thank you @Karen Margrave for beating me to it! On rereading the original post I have a question. What do you mean by lightly sand and do new texture? Knockdown texture and new paint would be all we would do on a house we are flipping or keeping as a rental. An exception to this is the basement of a home. Many homes were built with unfinished basements. So then a homeowner would try to hang drywall and finish it and many times it looked horrible! So bad in fact that many times it was probably torn out and someone just started over. Again, in common ordinary circumstances I believe you can do the knockdown texture and paint and you're good to go! 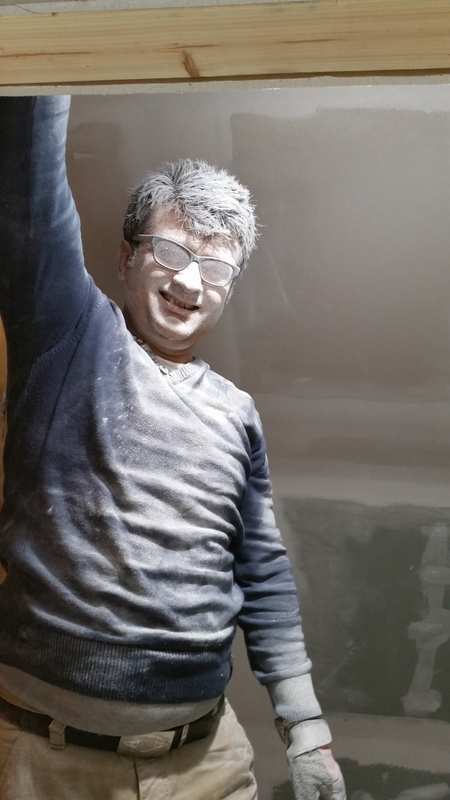 Are you talking about drywall that has been sprayed or rolled with some kind of textured paint or plaster? @Karen Margrave Hey Karen, we do what we call the: "if this was my house test"? Typically, we demo all the drywall to take a peek behind to ensure insulation is up to code anyway, but I can understand as this a 70s house, therefore you may be fine. That said, it's best to be safe. cara is right. Don't waste the time or money unless there's moisture or rot is present. Spot texturing or trying to match is difficult to do. @Maurice Grant She comes from a spec build industry. Light sanding is a must for commercial, it is an additional step/layer of protection to ensure adhesion. I did a 1200 sq ft 70's SFH with not only popcorn ceilings but with very heavy adobe plastered walls so skimming was not an option. (Much of the old pre 70's popcorn & sheetrock has asbestos in it). I had 1x3 strapping attached to the walls & ceilings & added 1/2inch drywall. 2 guys $1175 including mud & sanding. I was replacing all the old metal outlet boxes so it was not an issue with moving them all out to compensate for the extra depth. Finished walls/ceilings looked great & I've never regretted it. We are about to do another (circa 1939) flip with another run of semi-adobe/patterned walls so I will do the same. In both cases the walls/ceilings were in excellent condition structurally & otherwise. No cracks, no obvious signs of moisture. @Pat L. you got guys to hang strapping, drywall, tape and compound an entire 1200 SF house, walls and ceilings for $1175, in NY? Think they would drive to my location?? My friend got a quote on a slightly larger house, 1500 SF and he was over $6000 for just tape and compound, no hanging, no strapping. Thanks everyone. For background, we have always been new spec construction builders. The last homes we did were in coastal Orange County, CA and had the smooth finish drywall applied. Extremely expensive. Those were homes close to $2 million each. 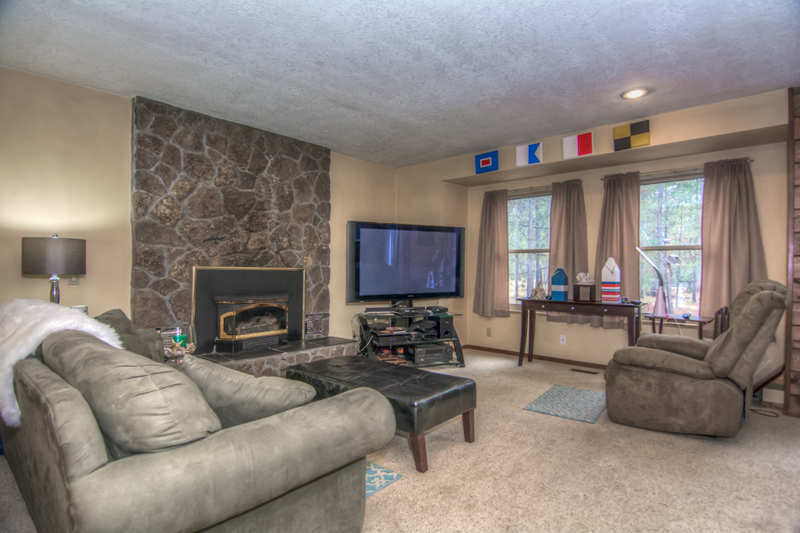 We've now relocated to Oregon, the Sunriver area, where we have a remodel. We will be opening up the great room (top photo) as well as redoing the fireplace, flooring (basically everything), and reworking the floor plan to give it a more open concept plan. 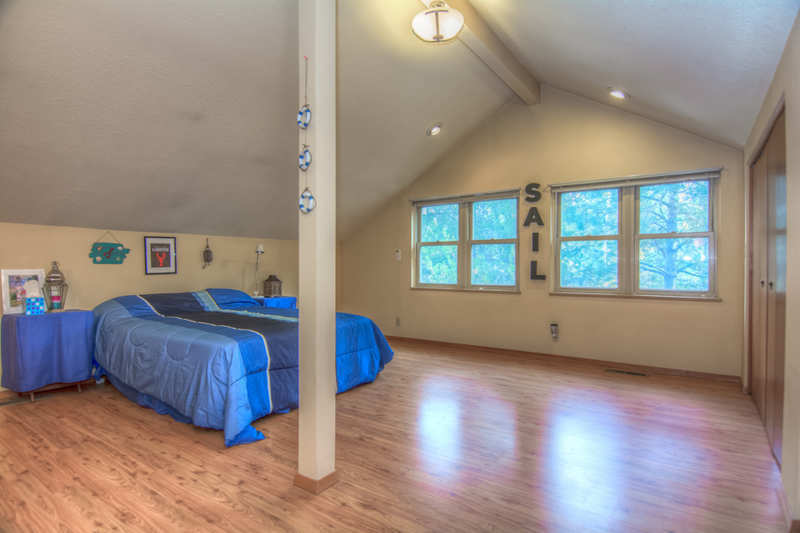 The lower photo is an over the garage attic space that we're considering doing a shed roof on to get more head space and turning into a Master suite. Most of these homes are used as 2nd homes or vacation rentals. The paint is so thin. The tenant says the black on the walls is from the fireplace flue not being closed causing smoke to get on everything. Any other suggestions are appreciated. Get some oil based paint that isn't diluted, and roll it on. It will go on much thicker than latex (water-based) paint. I'll replace the sheetrock in areas where it makes sense to. I do my own skim coating, but by the time you build it up and sand it down, sometimes it's just easier (and quicker) to start from scratch. 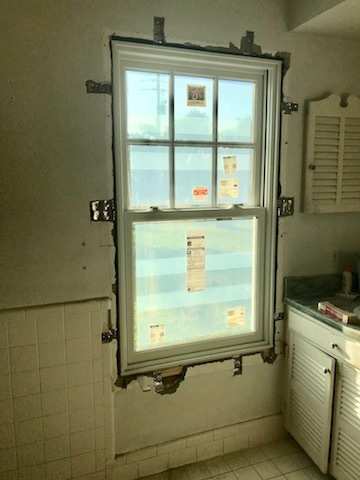 When we replaced windows on a 1966 house with impact-windows recently, the installer had to remove 3-inch gashes in the plaster/sheetrock in order to affix them to the frame with metal strapping. The diversity in comments above lets me know that a) matching is difficult, and a range of pricing. @Karen Margrave , I look forward to seeing the results of your remodel. Let us know what you decide! The only real reason to replace it is if you needed to demo it to get to electrical/plumbing behind it, or if there is a mold issue or ongoing water issue. Stains, cracks, holes and tape joints can all be fixed easily rather than replaced. @Brian Pulaski Yes they were great BUT they really needed the work. Plus I held the notes on several of the lead hands rentals. But unfortunately their days of hard work are over. One is living in a garage somewhere & the other is on skid row. I now have a guy who barely sands just applies mud then smooths/finishes with sponges. Amazing work especially with tile & he is also our live-in maintenance guy. Then I found this guy who busted his azz for $10/hr. Always wore gloves but refused to wear a mask!! !....His BBQ cooking for the guys was simply amazing. @Michael Volek we supply all safety equipment but he was also a VERY heavy smoker, so the mask was annoying. But we finally convinced him to kick that habit. @Pat L. now which habit would that be, smoking or not wearing the mask? Lol. Trust me I know the feeling well, I painted military aircraft for over a decade. Some guys just flat out refuse to wear their PPE. But they understand the consequences, and I'm not trying to get on them like a parent. Still I'm glad to hear he came around. I don't want that on my conscience if God forbid he became ill because of it. a suggestion about popcorn ceilings. our painter has developed a system whereby she does a "dry scrape" of popcorn ceilings.